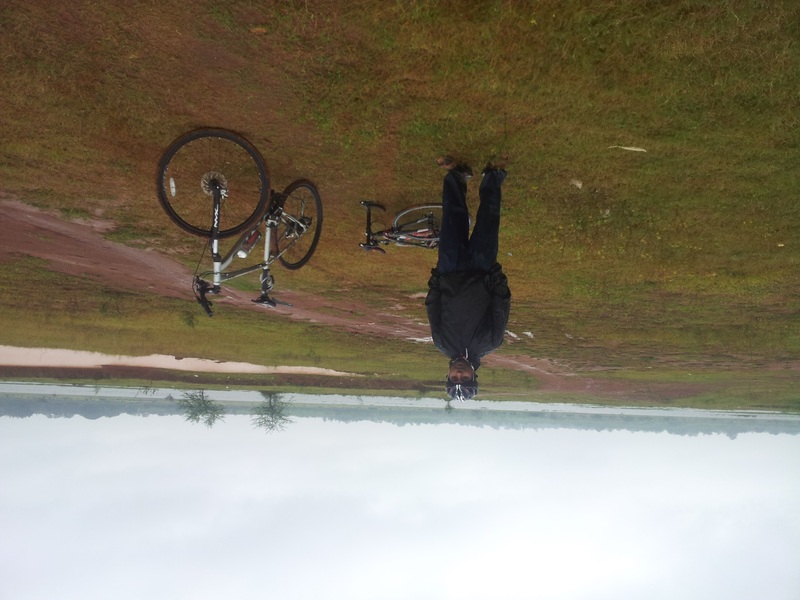 Riding to Hesaraghatta Lake on a rainy day. Velominati Rule #9: If you are out riding in bad weather, it means you are a badass. Period. Today was a holiday for us. After doing a 65 km roundtrip of Chikka Tirupati last weekend, me and one of my colleagues, Ravish Verma, decided to do a longer trip. I asked him to pick the route. He ended up planning a round trip of Hesaraghatta Lake. It has been raining non-stop since yesterday. When I woke up, I felt like calling Ravish up and telling him that I did not want to go. Ravish called me first and told that he was ready (to be a badass). I reluctantly said that we would hit the road and do as much as possible. We may not even go till the lake. But we did. In bad weather. Although this was not the intended route, we got lost five times and had to either re-plan the route or track back to a known point. 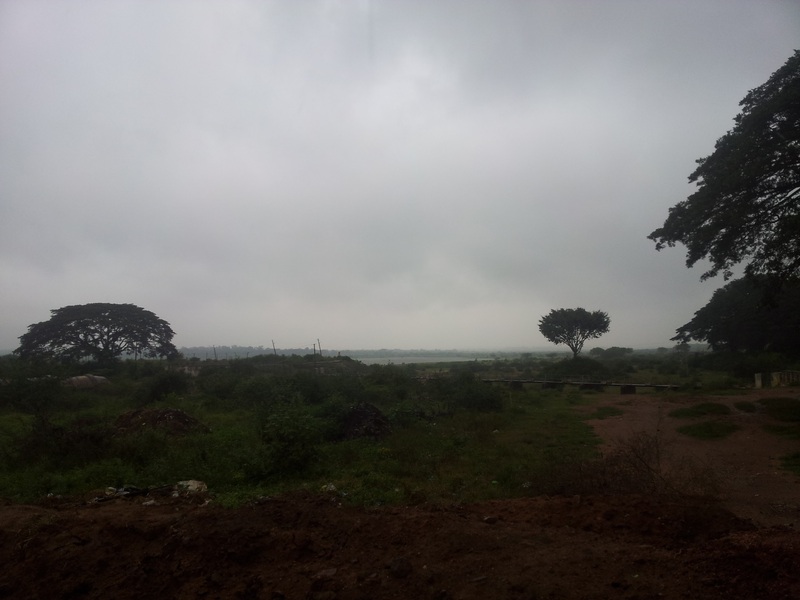 Hebbal Lake looked really nice in the rain. When we were on Jakkur flyover, the drizzle was accompanied by a very strong headwind. Daniel Behrman’s famous quote felt so true, “You never have the wind with you – either it is against you or you’re having a good day.” That was the point when Ravish reminded me about Velominati’s rule number nine. That area near Hesaraghatta is packed with institutes. These are government colleges and research centres that deal with agriculture, horticulture, ayurveda, poultry, fisheries, dairy, etc. I lost track of the number of institutes we crossed. For most part the roads are pretty good. There was a short stretch that had cobbles. Thankfully, that ordeal was over in twenty minutes. 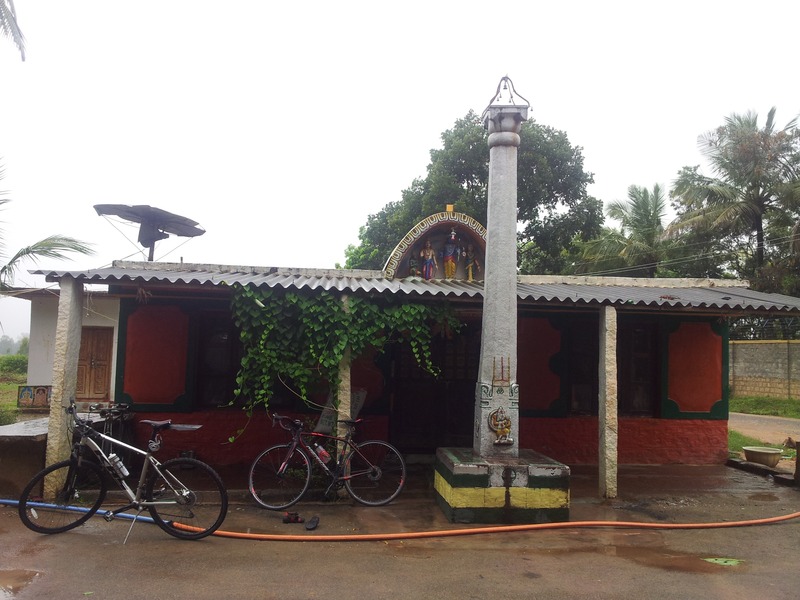 This temple is just opposite to Indian Veterinary Research Institute. It was a nice spot before we hit the cobbles. Getting to Heseraghatta Lake is tricky. You have to get off the tarmac. The first time, we tried to get to the lake bed from the eastern side. We ended up hitting a dead end- right at the entrance of BWSSB campus. 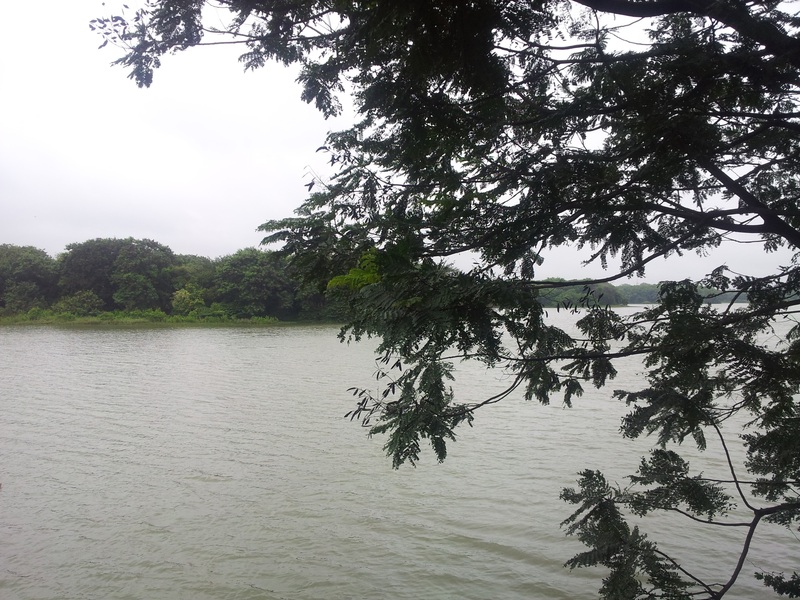 Hesaraghatta Lake from the South-East. Later we took the western road but after about five kilometres, we realised that we had drifted further off. (To be precise we had crossed the Central Poultry Department and Training Institute.) The GPS was actually pointing to a muddy road that we had missed. It was time for me to get into cyclocross mode! I carried the cycle into the river bed. 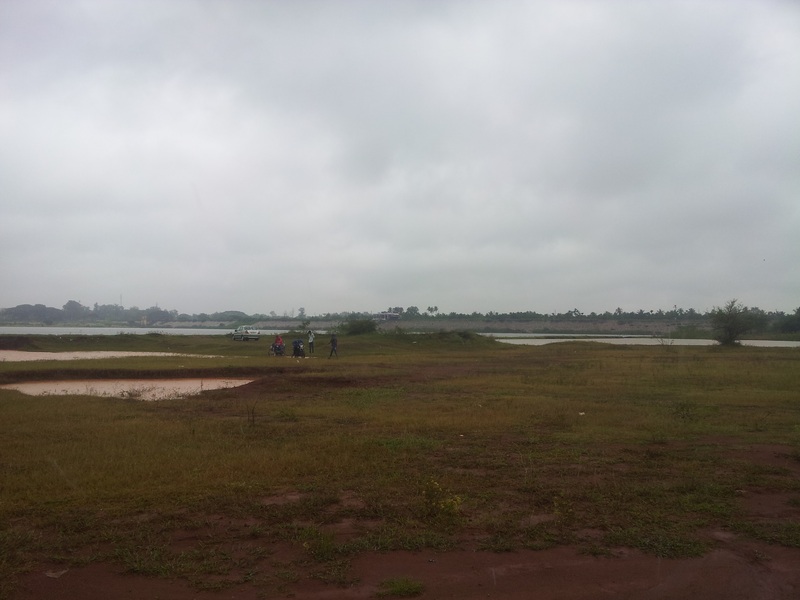 The lake bed from its Western entrance. The college kids in this picture were busy washing sticky clay off their motorbikes. When we reached the waters, there was a layer of thick sticky clay on my keto style sandals and Ravish’s shoes. Yes, I would have broken several style guidelines / rules of Velominati (sandals on clipless pedals, baggy rain attire) but I am used to breaking them often (function over form). Ravish’s wet shoes were perhaps more uncomfortable than my open sandals. Find 10 Faux Pas. I bet that would be easy. Few college kids were fooling around with Dio’s, Pulsar’s and Splendor’s on the soft river bed. They were emulating the behaviour of dirt bikes. It was already lunch time when we walked out of the lake bed. I used quite a lot of my drinking water to clear the drivetrain and the rims. Ravish mentioned that he had seen a dhaba en route and we could have lunch there. The place was called Unnathi Family Restaurant Veg & Non-Veg. 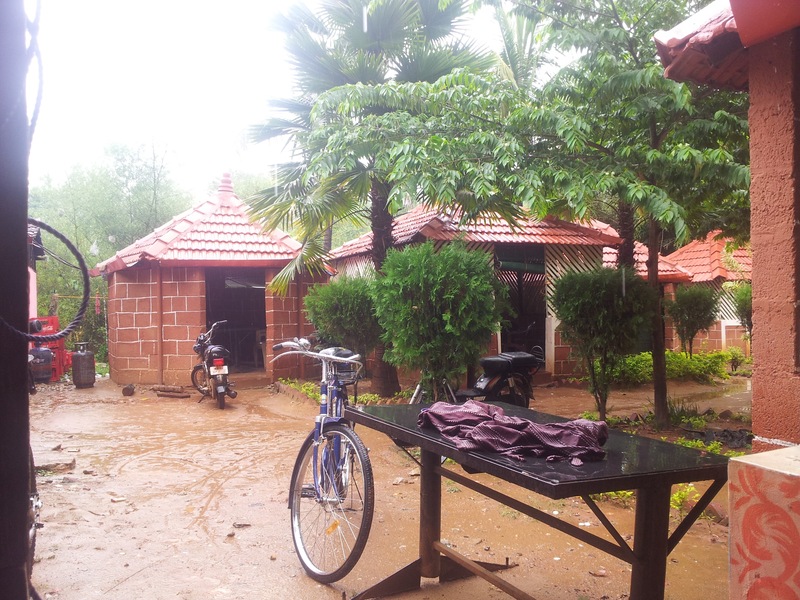 The dhabas in Hesaraghatta have cabins like these. 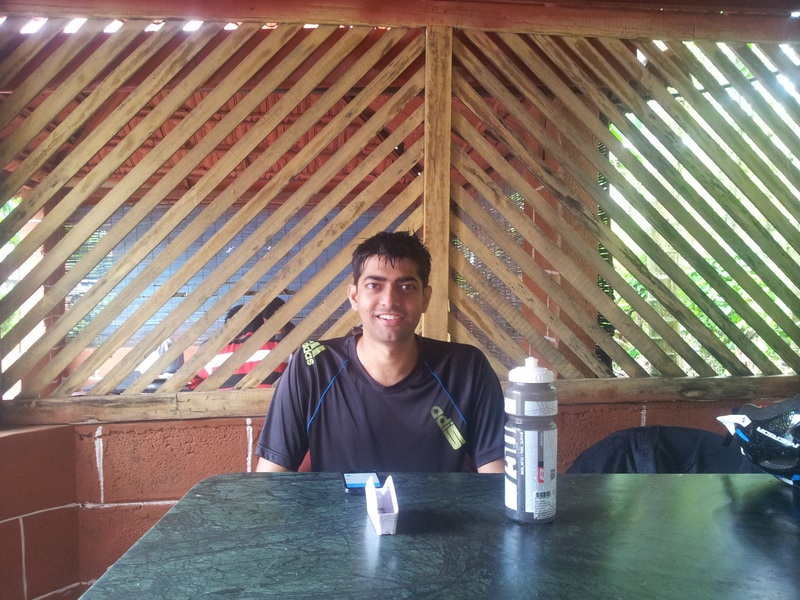 Ravish waiting for the meal. We shared a plate of tomato rice, dal and chicken curry. We decided to avoid the cobbles and instead take another route through BEL circle. There were at least three uphill regions that had seriously tested my mental and physical strength. I don’t remember where exactly they were. (I believe it’s the route adjoining Jarkabandi State Forest.) I did not know the area at all and neither did Ravish. We took wrong roads thrice after which we were checking Google maps after each junction unless there was a board. 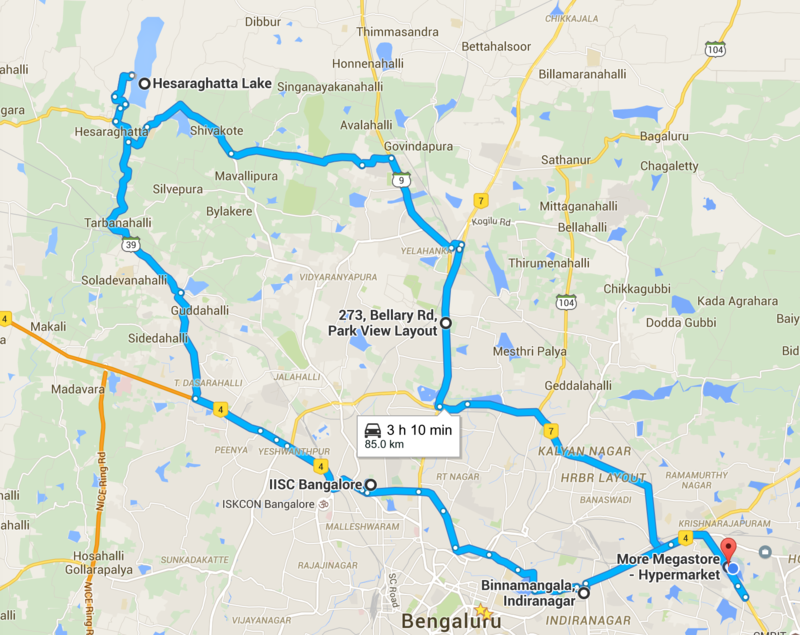 Thankfully, once we reached Ulsoor, I knew the route back to my house pretty well.